Exploring the waters of Belize has given me an entire new perspective on marine life. I grew up snorkeling on one of the most beautiful places off the coast of California in a spot called Emerald Bay off Catalina Island and thought I was truly blessed, but can attest that I have never seen such biodiversity and vibrance of marine life as I have seen here in Belize! We opted for the early boat tour as the early bird usually “gets the worm” or in this case, a nice afternoon nap before heading back out to enjoy the rest of the day. We were whisked away on a 20-minute boat ride out to Shark Ray Alley, enjoying the wind in our hair and the sea mist on our faces. Our guide warned us that we needed to be quick and jump in the water as soon as we pulled up because the sharks are known to dine and dash after all the bait is gone. I was a little apprehensive to get in as I’ve only been in the water with one or two small sharks, not ten or twelve 6 foot sharks! 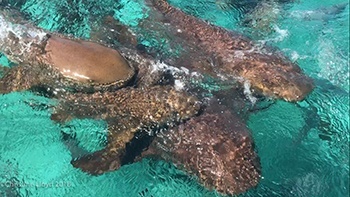 The nurse sharks were very clever, forming themselves into a tight group around the bait so that the Horse-eyed Jacks didn’t steal it all from them. Once the food was gone they moved on to the next boat, but that was fine with me, as I then got to spend some one-on-one time with a single shark that was taking a little snooze under some coral. Next stop was Hol Chan Marine Reserve and boy was I impressed. Before you even get in you can see to the very bottom of the sand through the crystal clear water. We jumped out and followed our guide around for about 30 minutes of pure snorkeling bliss as he pointed out all the fish and the break in the reef. Some of the most vibrantly-colored fish were some of the smallest ones! Yellowhead Wrasse with bright yellow heads and turquoise bodies, magenta Fairy Basslets, deep blue Tangs, and Blue Striped Grunts with electric blue stripes running across their bodies. Horse-eyed Jacks, relatives of tuna, followed us around the entire time. They are so incredibly fast and they are always the first to eat the bait that the tour guides throw for the nurse sharks and keep in their pockets to give the patrons a show. Yellow and black striped Sergeant Major fish were aplenty, in all sizes! I found some big ones who came out to play and small ones in a coral, who became very nervous once I showed up and started filming, though they did eventually come out of their coral home and investigate me. They were only a few centimeters but they were already so brightly colored! Schoolmaster Fish and Small Mouth Grunt were in abundance as well. The one with the vertical stripes is the Schoolmaster, the rest with no stripes are the Smallmouth Grunt. My favorite fish encounter was the most beautiful rainbow parrot fish that I ran into by chance at the end of our tour on our way back was to the boat. Our tour guide Jaime helped me corral him to get him in a spot where the light reflected off his colorful scales. Parrot fish are responsible for majority of the white sand on the beaches as they eat the coral and digest it, turning it into sand. Some of the other common fish we saw are listed below. What was really amazing to see was the way that the locals know and interact with the reef. Jose Aguilar, a tour guide of 5 years, currently working with Searious Adventures was specifically talented at eel charming. He would dive down and lure the Green and Spotted Moray eels out of their dens with some bait and then somehow keep them in line as they swam out to investigate the tour participants. Needless to say, I am always impressed with anyone who dares to tango with an eel! 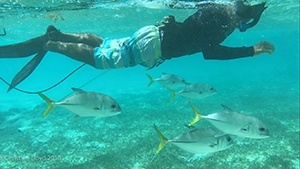 It’s been amazing to not only experience the marine life here but learn about how many different functions the reef provides for the well-being of all the islands here in Belize. 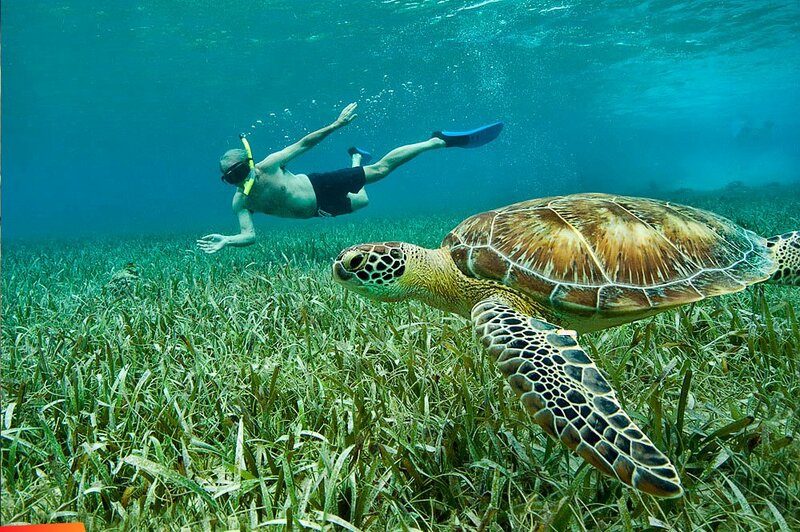 As the main tourist attraction of Belize, the reef is not only incredible to see, but incredibly important to protect, so keep that in mind when you come to visit! And if you are unsure of where to go for your next vacation, you’d be missing out big time if you don’t put Belize on your map. I highly recommend that everyone come see the beauty of the Belizean barrier reef for themselves! Christine is originally from Los Angeles, and has a degree in economics and a passion for visual-storytelling. At the age of 22, she moved to San Francisco to work as a Contract Surety Underwriter for Liberty Mutual Insurance and contributed to some massive construction projects in the Bay Area and Northern California. 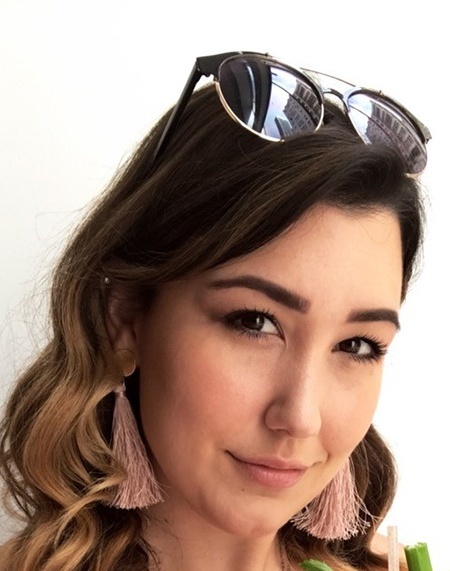 After three years working in construction insurance she is taking some time off to travel and start her digital marketing business, Digitizing Locals, helping local businesses with their online presence. She is thoroughly enjoying her time in Belize, spending as much of it in the water as she can!